Elements Applied: Each plant’s part, including its seeds, but except the root, is applied in herbal medicine. Used For: The remedy boosts urination, stimulates the organism, relieves flatulence, eliminates spasms, and serves as an aid in treating kidney stones. 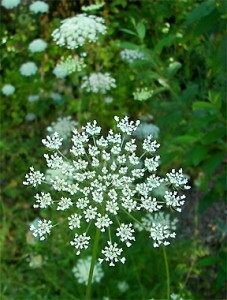 Volatile oil, found in wild carrot, is greatly valued for its antiseptic properties produced on the urinary tract. It’s highly beneficial in curing prostatitis and cystitis. For a long period it has been applied for treating kidney stones. When it comes to rheumatism and gout, the herb is used in conjunction with other medicines to elevate their potency due to its diuretic capacity. The seeds are widely applied to fight bowel colic and flatulence. Commonly mixed with: To elevate the effect the herb is combined with bearberry and yarrow in treating urinary tract diseases. To treat kidney stones the remedy is mixed with Gravel Root and Hydrangea. Additional Info: The herb is native to Northern Africa, North America, Asia, and Europe. Preparation and Intake: For an infusion take 1 teaspoon of dried herb extract and fill it up with a glass of boiling water. Let it stay for 15 minutes. The infusion is taken thrice a day. To make an infusion on seeds, take ½-1 teaspoon for a cup of boiling water. Safety: There is no data concerning the plant’s safety level. Still, there is a possibility of interaction with the chemical medicines. Call your health-care provider before trying the medication.